A hint of spice. A hint of smoke. A delicate balance of bold flavors. 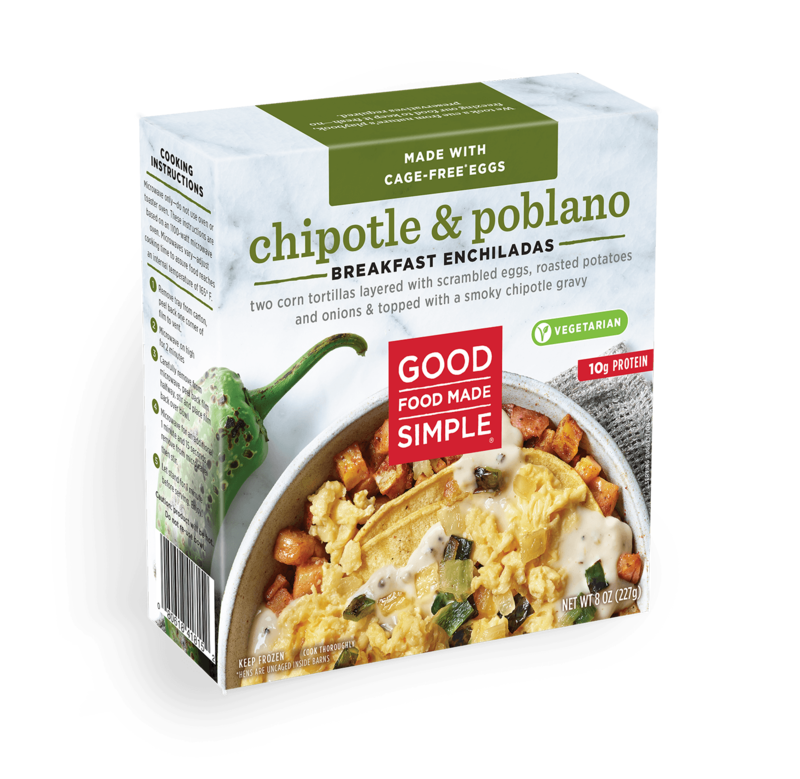 Our Chipotle and Poblano dish layers corn tortillas with fire roasted potatoes and scrambled cage-free eggs then finishes it off with a smoky chipotle and poblano gravy. GRAVY (ORGANIC MILK [ORGANIC MILK, VITAMIN D3], GREEN CHILE, ORGANIC UNSALTED BUTTER, ORGANIC WHEAT FLOUR, WATER, CORN STARCH, SEA SALT, SPICE, CHIPOTLE ADOBO PUREE [WATER, ONION, DRIED CHIPOTLE PEPPER, TOMATO PASTE, CANOLA OIL, CANE SUGAR, VINEGAR, SALT, GARLIC PUREE, NATURAL SMOKE FLAVORING, SPICES]), ORGANIC ROASTED POTATOES (ORGANIC POTATOES, ORGANIC OLIVE OIL), ORGANIC YELLOW CORN TORTILLA (ORGANIC YELLOW CORN FLOUR, WATER, ORGANIC GUAR GUM, LIME), SCRAMBLED WHOLE EGGS (CAGE FREE* WHOLE EGGS, MILK, NON-GMO CORN STARCH, SEA SALT, SPICE), ORGANIC ONIONS, POBLANO CHILE PEPPERS, ORGANIC CANOLA OIL, ORGANIC CHILI POWDER (ORGANIC SPICES, SEA SALT, ORGANIC GARLIC, SILICON DIOXIDE), SEA SALT.